A depiction of magnetic moments obtained using the hybrid WL-LSMS modeling technique inside nickel (Ni) as the temperature is increased from left to right. At low temperature (left), Ni atoms in their magnetic moments all point in one direction and align. At higher temperature (right) snapshots at different times show the moments pointing in different, random directions, and the individual atoms no longer perfectly align. Image courtesy of Oak Ridge National Laboratory. 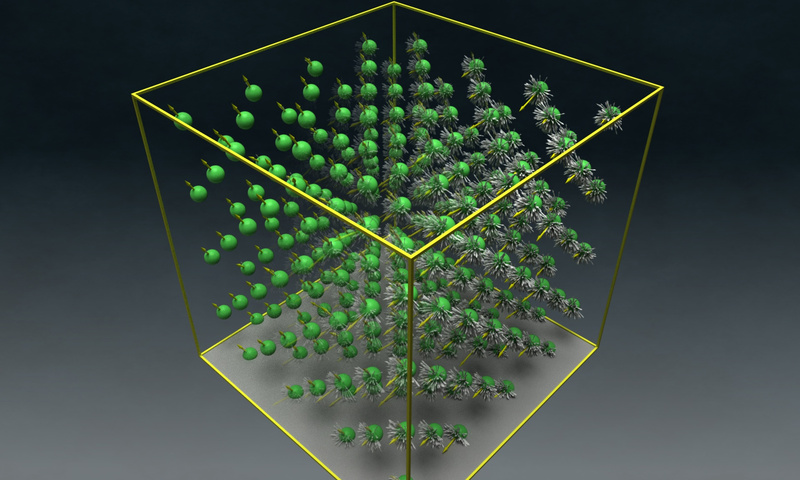 The atoms inside materials are not always perfectly ordered, as usually depicted in models. In magnetic, ferroelectric (or showing electric polarity) and alloy materials, there is competition between random arrangement of the atoms and their desire to align in a perfect pattern. The change between these two states, called a phase transition, happens at a specific temperature. Markus Eisenbach, a computational scientist at the Department of Energy’s Oak Ridge National Laboratory, heads a group of researchers who’ve set out to model the behavior of these materials using first principles – from fundamental physics without preset conditions that fit external data. The researchers’ models also could help find strong, versatile magnets that don’t use rare earth elements as an ingredient. Located at the bottom of the periodic table, these 17 materials come almost exclusively from China and, because of their limited source, are considered critical. They are a mainstay in the composition of many strong magnets. 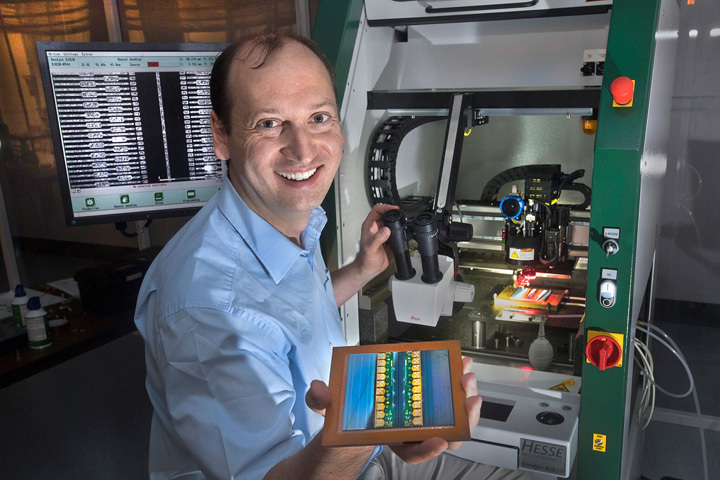 Eisenbach and his collaborators, which includes his ORNL team and Yang Wang with the Pittsburgh Supercomputing Center, are in the second year of a DOE INCITE (Innovative and Novel Computational Impact on Theory and Experiment) award to model all three materials at the atomic level. They’ve been awarded 100 million processor hours on ORNL’s Titan supercomputer and already have impressive results in magnetics and alloys. 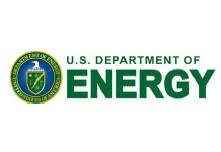 Titan is housed at the Oak Ridge Leadership Computing Facility (OLCF), a DOE Office of Science user facility. The researchers tease out atomic-scale behavior using, at times, a hybrid code that combines Wang-Landau (WL) Monte Carlo and locally self-consistent multiple scattering (LSMS) methods. WL is a statistical approach that samples the atomic energy landscape in terms of finite temperature effects; LSMS determines energy value. With LSMS alone, they’ve calculated the ground state magnetic properties of an iron-platinum particle. And without making any assumption beyond the chemical composition, they’ve determined the temperature at which copper-zinc alloy goes from a disordered state to an ordered one. Moreover, Eisenbach has co-authored two materials science papers in the past year, one in Leadership Computing, the other a letter in Nature, in which he and colleagues reported using the three-dimensional coordinates of a real iron-platinum nanoparticle with 6,560 iron and 16,627 platinum atoms to find its magnetic properties. Alloys are comprised of at least two metals. Brass, for instance, is an alloy of copper and zinc. Magnets, of course, are used in everything from credit cards to MRI machines and in electric motors. Ferroelectric materials, such as barium titanate and zirconium titanate, form what’s known as an electric moment, in a transition phase, when temperatures drop beneath the ferroelectric Curie temperature – the point where atoms align, triggering spontaneous magnetism. The term – named after the French physicist Pierre Curie, who in the late 19th century described how magnetic materials respond to temperature changes – applies to both ferroelectric and ferromagnetic transitions. Eisenbach and his collaborators are interested in both phenomena. Eisenbach is particularly intrigued by high-entropy alloys, a relatively new sub-class discovered a decade ago that may hold useful mechanical properties. Conventional alloys have a dominant element – for instance, iron in stainless steel. High-entropy alloys, on the other hand, evenly spread out their elements on a crystal lattice. They don’t get brittle when chilled, remaining pliable at extremely low temperatures. To understand the configuration of high-entropy alloys, Eisenbach uses the analogy of a chess board sprinkled with black and white beads. In an ordered material, black beads occupy black squares and white beads, white squares. In high-entropy alloys, however, the beads are scattered randomly across the lattice regardless of color until the material reaches a low temperature, much lower than normal alloys, when it almost grudgingly orders itself. Eisenbach and his colleagues have modelled a material as large as 100,000 atoms using the Wang-Landau/LSMS method. “If I want to represent disorder, I want a simulation that calculates for hundreds if not thousands of atoms, rather than just two or three,” he says. All of a material’s properties and energies are calculated by many hundreds of thousands of calculations over many possible configurations and over varying temperatures to give a rendering so that modelers can determine at what temperature a material loses or gains its magnetism, or at what temperature an alloy goes from a disordered state to a perfectly ordered one. Eisenbach eagerly awaits the arrival of the Summit supercomputer – five to six times more powerful than Titan – to OLCF in late 2018. 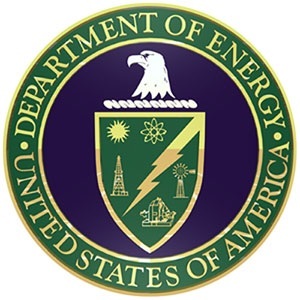 Three scientists at the U.S. Department of Energy’s (DOE) Brookhaven National Laboratory have been selected by DOE’s Office of Science to receive significant research funding through its Early Career Research Program. The program, now in its eighth year, is designed to bolster the nation’s scientific workforce by providing support to exceptional researchers during the crucial early career years, when many scientists do their most formative work. The three Brookhaven Lab recipients are among a total of 59 recipients selected this year after a competitive review of about 700 proposals. The scientists are each expected to receive grants of up to $2.5 million over five years to cover their salary plus research expenses. A list of the 59 awardees, their institutions, and titles of research projects is available on the Early Career Research Program webpage. Low Temperature Oxidative Methanol Synthesis from Methane.” His overarching goal is to study and improve catalysts that enable the conversion of methane (CH4), the primary component of natural gas, directly into methanol (CH3OH), a valuable chemical intermediate and potential renewable fuel. This research builds on the recent discovery of a single step catalytic process for this reaction that proceeds at low temperatures and pressures using inexpensive earth abundant catalysts. The reaction promises to be more efficient than current multi-step processes, which are energy-intensive, and a significant improvement over other attempts at one-step reactions where higher temperatures convert most of the useful hydrocarbon building blocks into carbon monoxide and carbon dioxide rather than methanol. 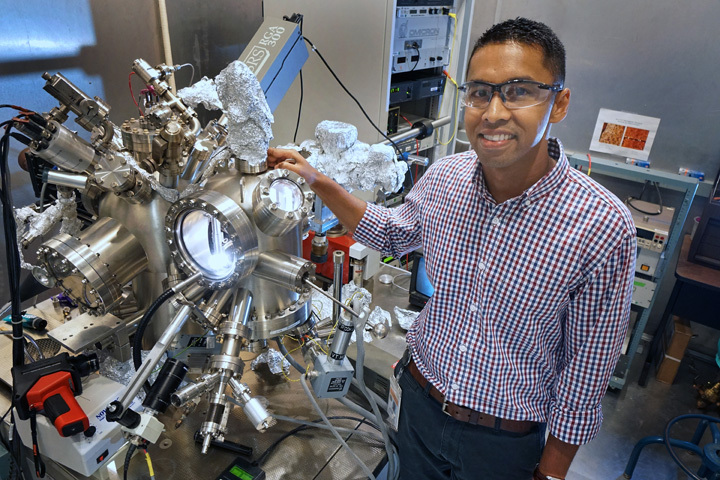 With Early Career funding, Senanayake’s team will explore the nature of the reaction, and build on ways to further improve catalytic performance and specificity. The project will exploit unique capabilities of facilities at Brookhaven Lab, particularly at the National Synchrotron Light Source II (NSLS-II), that make it possible to study catalysts in real-world reaction environments (in situ) using x-ray spectroscopy, electron imaging, and other in situ methods. Experiments using well defined model surfaces and powders will reveal atomic level catalytic structures and reaction dynamics. When combined with theoretical modeling, these studies will help the scientists identify the essential interactions that take place on the surface of the catalyst. Of particular interest are the key features that activate stable methane molecules through “soft” oxidative activation of C-H bonds so methane can be converted to methanol using oxygen (O2) and water (H2O) as co-reactants. This work will establish and experimentally validate principles that can be used to design improved catalysts for synthesizing fuel and other industrially relevant chemicals from abundant natural gas. Sanjaya Senanayake earned his undergraduate degree in material science and Ph.D. in chemistry from the University of Auckland in New Zealand in 2001 and 2006, respectively. He worked as a research associate at Oak Ridge National Laboratory from 2005-2008, and served as a local scientific contact at beamline U12a at the National Synchrotron Light Source (NSLS) at Brookhaven Lab from 2005 to 2009. He joined the Brookhaven staff as a research associate in 2008, was promoted to assistant chemist and associate chemist in 2014, while serving as the spokesperson for NSLS Beamline X7B. He has co-authored over 100 peer reviewed publications in the fields of surface science and catalysis, and has expertise in the synthesis, characterization, reactivity of catalysts and reactions essential for energy conversion. He is an active member of the American Chemical Society, North American Catalysis Society, the American Association for the Advancement of Science, and the New York Academy of Science. His work aims to improve, through precision measurements, the search for exciting new physics beyond what is currently described by the Standard Model [SM], the reigning theory of particle physics. But at the same time, despite direct searches for “new physics” signals that cannot be explained by the SM, scientists have yet to observe any evidence for such phenomena at the LHC—even though they know the SM is incomplete (for example it does not include an explanation for gravity). Tricoli’s research aims to make precision measurements to test fundamental predictions of the SM to identify anomalies that may lead to such discoveries. He focuses on the analysis of data from the LHC’s ATLAS experiment to comprehensively study electroweak interactions between the Higgs and particles called W and Z bosons. Any discovery of anomalies in such interactions could signal new physics at very high energies, not directly accessible by the LHC. 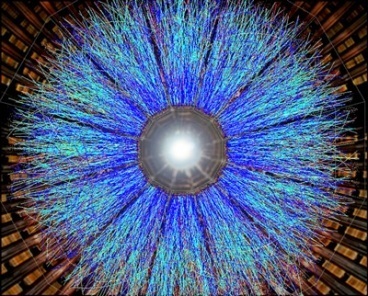 This method of probing physics beyond the SM will become even more stringent once the high-luminosity upgrade of ATLAS, currently underway, is completed for longer-term LHC operations planned to begin in 2026. Tricoli’s work will play an important role in the upgrade of ATLAS’s silicon detectors, using novel state-of-the art technology capable of precision particle tracking and timing so that the detector will be better able to identify primary particle interactions and tease out signals from the background events. Designing these next-generation detector components could also have a profound impact on the development of future instruments that can operate in high radiation environments, such as in future colliders or in space. “This award will help me build a strong team around a research program I feel passionate about at ATLAS and the LHC, and for future experiments,” Tricoli said. Alessandro Tricoli received his undergraduate degree in physics from the University of Bologna, Italy, in 2001, and his Ph.D. in particle physics from Oxford University in 2007. He worked as a research associate at Rutherford Appleton Laboratory in the UK from 2006 to 2009, and as a research fellow and then staff member at CERN from 2009 to 2015, receiving commendations on his excellent performance from both institutions. He joined Brookhaven Lab as an assistant physicist in 2016. A co-author on multiple publications, he has expertise in silicon tracker and detector design and development, as well as the analysis of physics and detector performance data at high-energy physics experiments. He has extensive experience tutoring and mentoring students, as well as coordinating large groups of physicists involved in research at ATLAS. 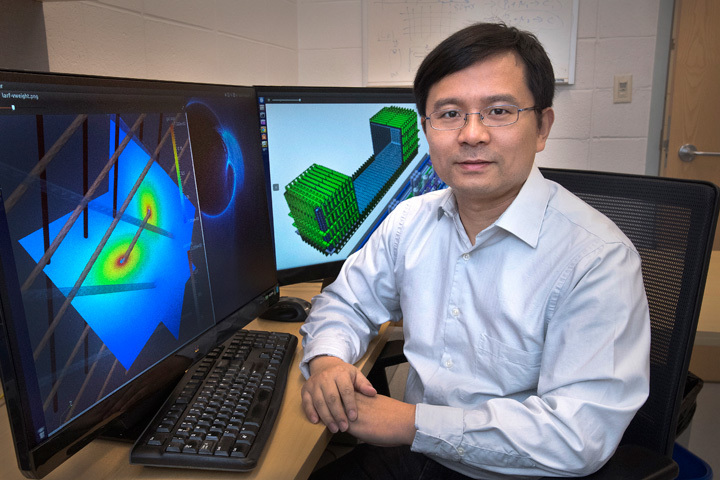 Brookhaven Lab physicist Chao Zhang was selected by DOE’s Office of High Energy Physics to receive funding for a project titled, “Optimization of Liquid Argon TPCs for Nucleon Decay and Neutrino Physics.” Liquid Argon TPCs (for Time Projection Chambers) form the heart of many large-scale particle detectors designed to explore fundamental mysteries in particle physics. Among the most compelling is the question of why there’s a predominance of matter over antimatter in our universe. Though scientists believe matter and antimatter were created in equal amounts during the Big Bang, equal amounts would have annihilated one another, leaving only light. The fact that we now have a universe made almost entirely of matter means something must have tipped the balance. A US-hosted international experiment scheduled to start collecting data in the mid-2020s, called the Deep Underground Neutrino Experiment (DUNE), aims to explore this mystery through the search for two rare but necessary conditions for the imbalance: 1) evidence that some processes produce an excess of matter over antimatter, and 2) a sizeable difference in the way matter and antimatter behave. The DUNE experiment will look for signs of these conditions by studying how protons (one of the two “nucleons” that make up atomic nuclei) decay as well as how elusive particles called neutrinos oscillate, or switch identities, among three known types. The DUNE experiment will make use of four massive 10-kiloton detector modules, each with a Liquid Argon Time Projection Chamber (LArTPC) at its core. Chao’s aim is to optimize the performance of the LArTPCs to fully realize their potential to track and identify particles in three dimensions, with a particular focus on making them sensitive to the rare proton decays. His team at Brookhaven Lab will establish a hardware calibration system to ensure their ability to extract subtle signals using specially designed cold electronics that will sit within the detector. They will also develop software to reconstruct the three-dimensional details of complex events, and analyze data collected at a prototype experiment (ProtoDUNE, located at Europe’s CERN laboratory) to verify that these methods are working before incorporating any needed adjustments into the design of the detectors for DUNE. Chao Zhang received his B.S. in physics from the University of Science and Technology of China in 2002 and his Ph.D. in physics from the California Institute of Technology in 2010, continuing as a postdoctoral scholar there until joining Brookhaven Lab as a research associate in 2011. He was promoted to physics associate III in 2015. He has actively worked on many high-energy neutrino physics experiments, including DUNE, MicroBooNE, Daya Bay, PROSPECT, JUNO, and KamLAND, co-authoring more than 40 peer reviewed publications with a total of over 5000 citations. He has expertise in the field of neutrino oscillations, reactor neutrinos, nucleon decays, liquid scintillator and water-based liquid scintillator detectors, and liquid argon time projection chambers. He is an active member of the American Physical Society. Twice a year, ESnet staff meet with managers and researchers associated with each of the DOE Office of Science program offices to look toward the future of networking requirements and then take the planning steps to keep networking capabilities out in front of those demands. Network engineers and researchers at DOE national labs take a similar forward-looking approach. Earlier this year, DOE’s SLAC National Accelerator Laboratory (SLAC) teamed up with AIC and Zettar and tapped into ESnet’s 100G backbone network to repeatedly transfer 1-petabyte files in 1.4 days over a 5,000-mile portion of ESnet’s production network. Even with the transfer bandwidth capped at 80Gbps, the milestone demo resulted in transfer rates five times faster than other technologies. The demo data accounted for a third of all ESnet traffic during the tests. Les Cottrel from SLAC presented the results at the ESnet Site Coordinators meeting (ESCC) held at Lawrence Berkeley National Laboratory in May 2017. Read the AICCI/Zettar news release. Read the story in insideHPC. National labs lead the push for operating systems that let applications run at exascale. Image courtesy of Sandia National Laboratories. For high-performance computing (HPC) systems to reach exascale – a billion billion calculations per second – hardware and software must cooperate, with orchestration by the operating system (OS). 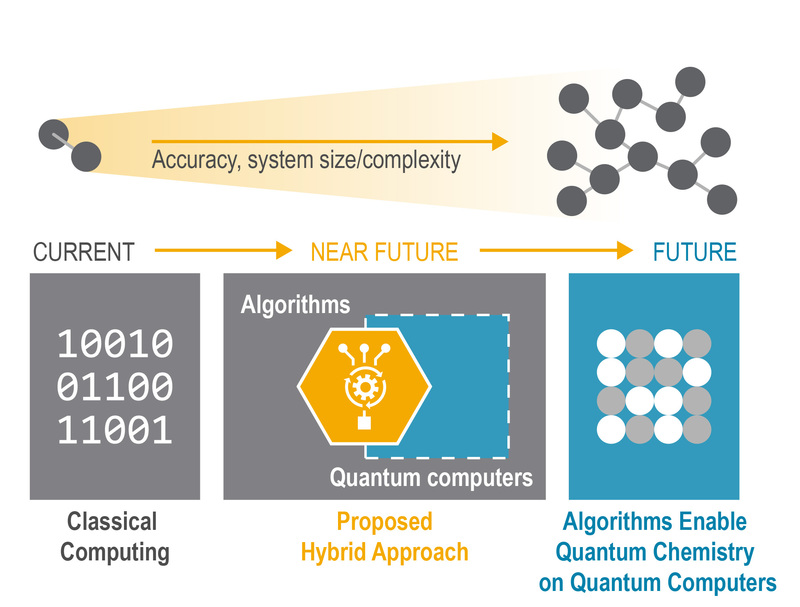 But getting from today’s computing to exascale requires an adaptable OS – maybe more than one. Computer applications “will be composed of different components,” says Ron Brightwell, R&D manager for scalable systems software at Sandia National Laboratories. “There may be a large simulation consuming lots of resources, and some may integrate visualization or multi-physics.” That is, applications might not use all of an exascale machine’s resources in the same way. Plus, an OS aimed at exascale also must deal with changing hardware. HPC “architecture is always evolving,” often mixing different kinds of processors and memory components in heterogeneous designs. To explore the needs of an OS and conditions to run software for exascale, Brightwell and his colleagues conducted a project called Hobbes, which involved scientists at four national labs – Oak Ridge (ORNL), Lawrence Berkeley, Los Alamos and Sandia – plus seven universities. To perform the research, Brightwell – with Terry Jones, an ORNL computer scientist, and Patrick Bridges, a University of New Mexico associate professor of computer science – earned an ASCR Leadership Computing Challenge allocation of 30 million processor hours on Titan, ORNL’s Cray XK7 supercomputer. The Hobbes OS supports multiple software stacks working together, as indicated in this diagram of the Hobbes co-kernel software stack. Image courtesy of Ron Brightwell, Sandia National Laboratories. The Hobbes project involved a variety of components, but for the OS side, Brightwell describes it as trying to understand applications as they become more sophisticated. They may have more than one simulation running in a single OS environment. “We need to be flexible about what the system environment looks like,” he adds, so with Hobbes, the team explored using multiple OSs in applications running at extreme scale. As an example, Brightwell notes that the Hobbes OS envisions multiple software stacks working together. The OS, he says, “embraces the diversity of the different stacks.” An exascale system might let data analytics run on multiple software stacks, but still provide the efficiency needed in HPC at extreme scales. This requires a computer infrastructure that supports simultaneous use of multiple, different stacks and provides extreme-scale mechanisms, such as reducing data movement. Part of Hobbes also studied virtualization, which uses a subset of a larger machine to simulate a different computer and operating system. “Virtualization has not been used much at extreme scale,” Brightwell says, “but we wanted to explore it and the flexibility that it could provide.” Results from the Hobbes project indicate that virtualization for extreme scale can provide performance benefits at little cost. Other HPC researchers besides Brightwell and his colleagues are exploring OS options for extreme-scale computing. For example, Pete Beckman, co-director of the Northwestern-Argonne Institute of Science and Engineering at Argonne National Laboratory, runs the Argo project. A team of 25 collaborators from Argonne, Lawrence Livermore National Laboratory and Pacific Northwest National Laboratory, plus four universities created Argo, an OS that starts with a single Linux-based OS and adapts it to extreme scale. When comparing the Hobbes OS to Argo, Brightwell says, “we think that without getting in that Linux box, we have more freedom in what we do, other than design choices already made in Linux. Both of these OSs are likely trying to get to the same place but using different research vehicles to get there.” One distinction: The Hobbes project uses virtualization to explore the use of multiple OSs working on the same simulation at extreme scale. As the scale of computation increases, an OS must also support new ways of managing a systems’ resources. To explore some of those needs, Thomas Sterling, director of Indiana University’s Center for Research in Extreme Scale Technologies, developed ParalleX, an advanced execution model for computations. Brightwell leads a separate project called XPRESS to support the ParalleX execution model. Rather than computing’s traditional static methods, ParalleX implementations use dynamic adaptive techniques. More work is always necessary as computation works toward extreme scales. “The important thing in going forward from a runtime and OS perspective is the ability to evaluate technologies that are developing in terms of applications,” Brightwell explains. “For high-end applications to pursue functionality at extreme scales, we need to build that capability.” That’s just what Hobbes and XPRESS – and the ongoing research that follows them – aim to do. Ingrid Fang is an engineering analyst at Fermi National Accelerator Laboratory (FNAL). She attended Northern Illinois University, where she earned a master of science degree in mechanical engineering. 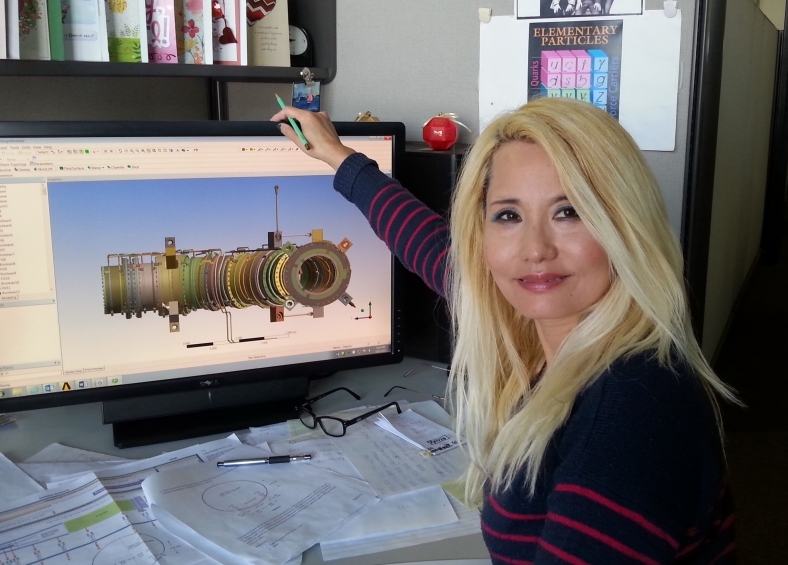 Ingrid Fang is an engineering analyst at Fermi National Accelerator Laboratory (Fermilab). She attended Northern Illinois University, where she earned a master of science degree in mechanical engineering. Ingrid says she enjoys her part in helping make history. 1) What inspired you to work in STEM? I had 10 years of professional ballet training, started when I was 4. I traded my ballet slippers for an engineering degree to please my dad. Dad is the biggest fan of Fermi lab and its groundbreaking work. I turn an idea into a reality by analyzing complex experimental equipment under mechanical and thermal loads. Working with ultra-dedicated and competent professionals. Studies have shown that when told that men score better on math tests than women, women tend to score worse. When told that this isn’t true, the two genders score equally well. I think women and girls should not focus on this internal bias toward underrating their intelligence. There are so many role models to follow if they empower themselves with an intense desire. Madame Curie and her daughter set a good example for me. 4) Do you have tips you’d recommend for someone looking to enter your field of work? A career can be intimidating at first, a great unknown hidden by your own anxiety and inexperience. But with passion and determination, you can succeed. Through this process you will build strong character, which money cannot buy. And when you look back on your life, those memories will be your most treasured, because those experiences defined who you really are. I like to read and study everything about life and its meaning. I am always searching to better myself, so I can make a positive contribution to our society, and in turn make a better life for everyone around me. I love to dance, and have volunteered to teach ballet to girls six years old and up. I have helped grownups get on the dance floor to feel young and alive again. I’ve helped people in poor health to find a meaning in their lives. I love to help people in need.